I'm curious if anyone is still growing it and what generation they're at. Edited by Portuge, 08 February 2014 - 03:07 PM. i planted some seeds but none sprouted. Next year i plan on trying again. I planted 3 and 2 sprouted, don't know which gen, its from Judy. I planted 5 and had all 5 come up. I only have room for two so I'm faced with a hard decision. All are very healthy looking plants. I'm not sure what generation but they came from a member here. Edited by Ignite, 08 February 2014 - 04:49 PM. My '14 starts should be F5. I will grow SB7J as long as I grow anything ! -- they are that GOOD ! I have a couple plants going Patrick. Not sure what F generation they are. I have 5 seedlings...from seeds from a member (cone9) here. Let's hope they live! He is from Ohio, after all. I got some F1's from you last year and saved seeds. So I am doing both F1 and F2 this year. Man I am loving this! Very cool to hear the cross is still alive and growing. 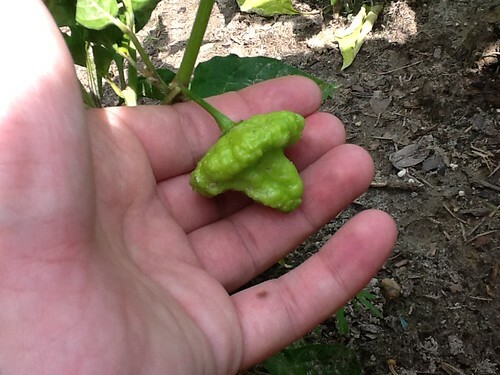 Everyone I've talked with who has grown it has said it is one of the best tasting hots out there. Of course I'm not taking any credit for it, Ma Nature did everything. SanPatricio I would love to get a few seeds from you of the F5 or next generation if possible. Just PM me your demands. Ignite I hate to year you have too many, hope you can find homes for them. I've got a couple of neighbors of mine that I've talked into adopting a few plants over the years. Thanks to everyone who has responded to the thread and for keeping this cross alive! I showed you in your glog, but I'd like to share here too. I'm growing the F4s from this selection. 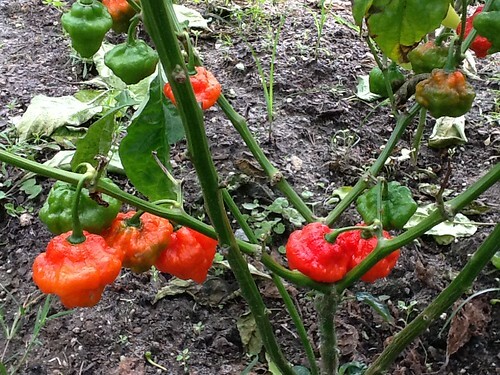 I'm trying to select for a bumpy Scotch bonnet shape like the ones in the pic. I've been calling this selection Atomic Scotch bonnet. I've been sharing the seeds with people and informing them that it's a selected SB7J that's probably not stable yet. Perhaps a bit premature to name (hard to resist this but will do so in the future), but everyone who received seeds was informed to what it is. I'm hoping one of us who grow this selection has a great Scotch bonnet shape, with lots of heat, and that lovely SB7J flavor. I wouldn't let the SB7J go to waste. I think we can pull lots of new chiles out of it. I also sent F3 seeds out to people. Those I just left as SB7J F3. The way you went about the SB7J inspired me to share tons of F2 7JPN (7 pot Jonah x Pimenta da Neyde) seeds with THP members interested. The SB7J felt like a gift to the community, so I wanted to do something similar . IMO the SB7J is one of the best hybrids, Patrick. It's been praised for its flavor in the pepper community. I really appreciate you sending them to me. I'll be stabilizing at least that Atomic Scotch bonnet. Perhaps with other members' help. Edited by Dulac, 09 February 2014 - 03:01 AM. Got 15 seeds in the sprouter. 10 of the correct pheno, 5 of the other. From pods, not sure the gen.
Each of the big rows in the aerogarden hold 5 sponges, so 15 is 3 rows. All the other varieties only get 1 row. It's good enough to take that much space for them imho. Wow that is a really cool shape. Almost looks like a mushroom cloud, which goes great with the atomic theme. There behind a glass is a real blade of grass; be careful as you pass; move along! move along! I got some of these from you on one of the trains and have quite a few seeds germinating. Also some from Vincent (Coheed196) that I believe are an off pheno.